Frisco, TX — Policing for profit in the United States is now the new norm. It has gotten so bad that the Canadian government has issued a public service announcement for its citizens warning them that American Road Pirates, aka police officers, may very well rob them upon entry into the US. In the US, “298 departments and 210 task forces have seized the equivalent of 20 percent or more of their annual budgets since 2008” according to a report by the Post. According to the US Department of Justice, the value of asset forfeiture recoveries by US authorities from 1989-2010 was $12,667,612,066, increasing on average 19.5% per year. In 2008, law enforcement took over $1.5 billion from the American public. While this number seems incredibly large, just a few years later, in 2014, that number tripled to nearly $4.5 billion. To put this number into perspective, according to the FBI, victims of burglary offenses suffered an estimated $3.9 billion in property losses in 2014. That means that law enforcement in America has stolen $600,000,000 more from Americans than actual criminal burglars. Some might try and say that this money and property is obviously “taken from criminals” in order to rationalize this theft on a massive scale. However, the government does not have to charge you with a crime, let alone convict you, to take your property and after they steal your property the burden of proof is on you to get it back. In Philadelphia alone, more than $64 million in seized property has been taken in the last decade and 100% of it has gone into the pockets of cops, judges, and other bureaucrats with a hand in the treasure chest. Consequently, none of the above cases include revenue generated from arbitrary traffic ‘laws’ for victimless crimes. The total number of people who receive speeding tickets only, is 41,000,000 a year with an average cost of $152.00 each. That is 1 in every 5 licensed drivers in the US. The total number of speeding tickets paid each year $6,232,000,000 which breaks down to around $300,000 generated per police officer for speeding alone. Tack on seat belt violations, license plate lights, window tint, rolling stop signs, and expired state-mandated stickers and that number skyrockets. Police departments need you to break traffic laws. Revenue generated from traffic tickets is not for your safety, it is necessary for the survival of police departments. Brett Sanders, a local activist in Frisco, Texas is well aware of the state’s extortion racket. So, he devised an epic plan to make that racket known to the people who carry it out. Earlier this year Sanders was given a ticket, otherwise known as a threat of police violence for failure to be extorted — he was travelling 39 mph in a 30 mph zone. It is particularly rare to receive a ticket for less than 10 miles over and even more rare to have it stick when you go to court. However, as Sanders tells us, the judge and prosecutor are well aware of his activism in the area. In January, Sanders and other activists signed up to be “crisis actors” in a government drill to infiltrate the drill and report on it from the inside. In December, Sanders and the folks over at the aptly named organization Don’t Comply, took to the streets just outside the Austin Street Shelter in Dallas to perform, what has now become a revolutionary act – feeding the homeless. The group was threatened with being shut down, as recent bits of legislation have made feeding the homeless near impossible without breaking a law. So, the group donned their AR-15 rifles and open carried the entire time — feeding hundreds of homeless people duiring the Christmas season. The police officer who cited Sanders even admitted to treating Sanders harsh. “I asked the cop on the stand if he would have given his wife a ticket under the same exact scenario, he said ‘no,'” Sanders explained. 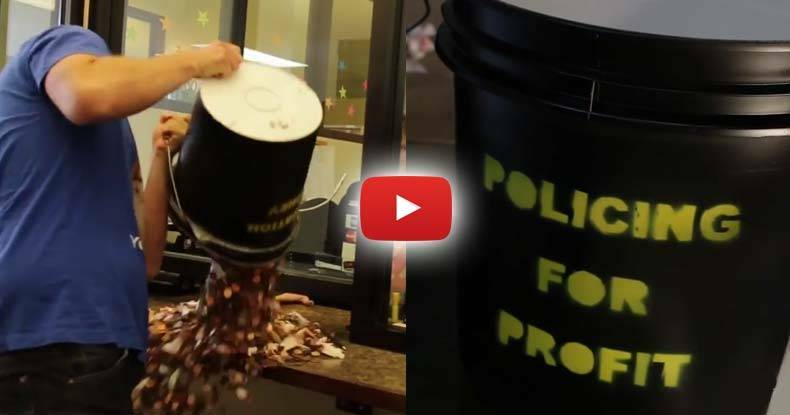 After being told that he now owes the state of Texas several hundred dollars, or he will face jail time, or even possible police violence, Brett decided to pay his fine — but it was going to get paid on his terms — in pennies. Below is the epic result his act of civil disobedience with a catch.